One of the suggestions you will come across a lot in various articles, books and youtube videos for screenwriting tips is "make the setting intriguing!". As someone trying to expand my horizons to become a better craftsman, one of the things I struggle with the most is settings. A script I submitted for notes, from a 1 to 10 regarding settings I got a 3. I don't get out much, so for me an intriguing setting is anywhere outside my washroom. So that is perhaps why I struggle with intriguing settings, and why you have to address your audience like they are kids with an attention deficit disorder (let's face it, they are). Every Sunday, when Game of Thrones and Silicon Valley are on, I notice that not only is the writing on both shows rich with symbolism (one prophetic, other ironic). They also know how to stage dialogue scenes in intriguing settings. GoT with its vast fantastic landscape (or on the edge of a prison cell carved into a mountain side). SV, with usually something ridiculous going on to the side, either in Erlich's house with Jian Yang doing something odd in the background, or last night's episode where Richard talked to CEO Jack Barker while two thoroughbred horses were mating. Let's back up a bit to take a look before this happens, Richard is in a meeting with the sales team when he realizes Barker has left the building for a Vet appointment. Now, this conversation could have easily happened in the office or in the back by a car, instead the writers decided to take it up a notch and have Richard track down Barker at a horse stable. Richard confronts Barker, but to his horror there's a stallion mounting a mare right in front of them, and the scene becomes absolutely hilarious (it also helps that Stephen Tobolowsky plays the scene completely deadpan.) Like I mentioned, this could have happened anywhere in a tech office, but because offices tend to be bland and familiar the show lives up to the challenge by spicing up the background. For Game of Thrones, there are many many examples on how to stage intriguing dialogue scenes, which considering it takes place in an imaginary universe it wouldn't be too hard but GoT excels at it. On the flipside, one show that suffers with staging dialogue scenes in dull situations is The Walking Dead. You have this fascinating post apocalyptic scenario, but often dialogue scenes seem to drag on because there's nothing going on beyond the two characters. You could make it funny, or gruesome, but they just....drag. You could argue they're saving those moments for action sequences, but compared to other shows it falls behind. Now back to Game of Thrones, last night Balon Greyjoy confronts his daughter Yara regarding the affairs of the Iron Islands empire. He remains steadfast in his footing and refuses to take his daughter's advice on how to conduct their defense. Due to the beliefs and morals of the Iron born, he decides to take the most destructive path. 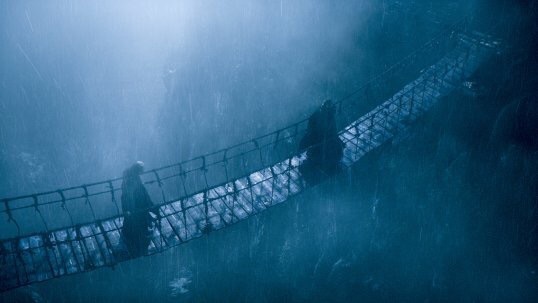 Upon leaving the keep he crosses a suspension bridge, over a chasm of angry waters below, during a STORM. Now, just look at those fantastic elements, and say "Let's stage a dialogue scene" (which would be a soundman's nightmare) but by golly it works. There are many examples of this in GoT but this one stuck out for me because it directly related to the previous confrontation with his daughter. He literally walked to his own demise. This could have happened within the keep, or walking along a beach, but a bridge in a storm. Fantastic. So there are two examples of how to stage a setting to learn from. I am trying to get into that frame of mind, but I guess these writers really know how to let the setting speak for itself. And boy, do they ever. One fantastic, the other, ridiculous.